Part II Mexican Fashion — does the right thing! After my last agitated post commenting on Mexican designers who don’t acknowledge their sources of ‘indigenous inspiration’ or give them any credit, I thought thought I might post Adele, of Latin Threads Trading, comments. She comes from a design company which has been working in Mexico for awhile – making high quality products for the mid range-market. (see link bottom of page). “I agree with arguments on both sides of this discussion…it is a complex issue with no easy answer re. wages and respect of native traditions. As for culture degradation, a friend who has worked many years in Chiapas with indigenous people once said to me, “The indigenous people see the commercial work they do for us as work, like going to a job every day. What we do with their product doesn’t matter to them as they have their own vibrant work that they do for themselves.” In my experience working with indigenous artisans, I would tend to agree. As for cutting up tired traditional garments and repurposing them, when I ask the indigenous women we work with what they do with their old and spoiled clothing, they tell me they throw them away. Why not preserve these remnants and enlighten the consumer with something that is both beautiful, cultural, AND functional? It is our mission (Latin Threads Trading) to create sustainable employment at fair wages for indigenous artisans doing what they do best, the traditional crafts of their respective villages. It is a long road, fraught with problems on both sides of the equation, one that requires time, patience, and cultural sensitivity. There is no excuse for not acknowledging the contributions made by these people within the fashion industry, but that is another discussion. But there’s good news! Designer Carmen Rion of Mexico City has worked with indigenous artisans in a number of her collections and happily acknowledges them. This seasons designs are inspired by the chales or mocheval/ capes of Zinacatan in the highlands of Chiapas. I’m including a video of the Pasisaje Mocheval Exhibit of some of Carmen’s most elegant and inspired mochevales at the Franz Meyer Museum in D.F. You’ll notice Zinacatan embroiderers in their full traje/costume enjoying the fruits of their labor. They were also included in the fashion show (See the second YouTube video). And although they might be too humble to say so, I’m sure they feel pride in being included. Currently I’m exploring the textiles of the Highland Mayas of Chiapas by visiting villages, markets, and if I’m lucky. a festival or ceremony in process. Many villages are having the changing of their civil and spiritual leaders through the passing of ‘cargos’ (obligations), so ceremonies are common and luckily for me, traditional costumes are in abundance. The downside of this story is that photographing their ceremonies and their costumes is prohibited by village tradition. On several occasions I just ‘got lucky’ and managed to get an image and other times I was invited to take a picture. Sometimes the images of these groups of people have been so stunning it will be indelible in my visual memory. 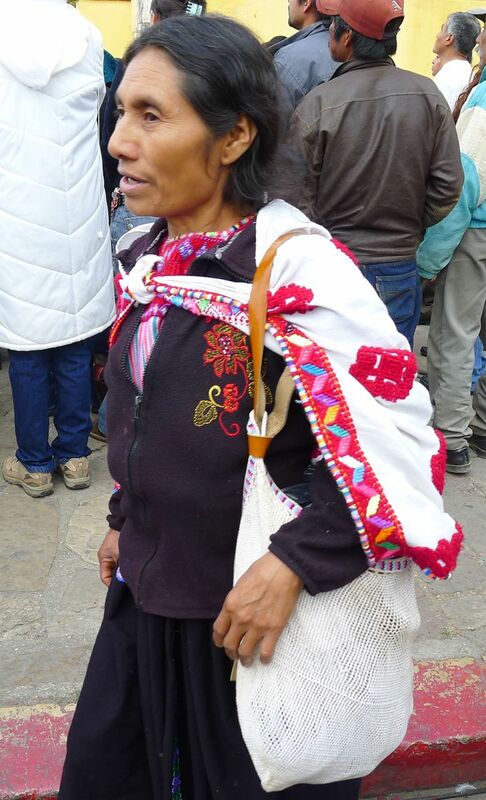 What I will try and do is give you a taste of the textiles worn by the people in the area of San Cristobal de las Casas. Some of these were in taken in the villages – others were taken on the street during the funeral Jan. 26, 2011 of the famous Bishop Samuel Ruiz who championed the rights of the indigenous people through the ‘theology of liberation’ in the 70’s . It is obvious which people were compliant in these images and I hope to have more textile friends like the V. Carranza weavers I am documenting with more in-depth information in the future. Enjoy this sampling of the beautiful and intricate textiles of Chiapas.